(CNN) - UCLA faced off against the University of Oklahoma Sunday in a gymnastics meet where the air was full of solidarity for members of both teams who suffered sexual abuse at the hands of Larry Nassar. The event honored five Nassar survivors: Olympic medalists Jordyn Wieber and Jamie Dantzscher, fellow UCLA alumni Mattie Larson and Jeanette Antolin, and University of Oklahoma sophomore Maggie Nichols. All five women hugged one another and their teammates as the audience on the UCLA campus in Los Angeles cheered. "Something like this, where you feel like a whole community is behind you, it's something I couldn't even imagine," Larson told CNN affiliate KABC. "It's overwhelming, but in an amazing way." Both teams wore shirts reading "Together We Rise" during the tribute, which they hope will inspire others who have had similar experiences to come forward. "I just want to let women know everywhere that you are strong enough, that your voice matters, your story matters. So stand up, it's time to rise up and speak our stories," Antolin told KABC. The competition concluded with a powerful video in which gymnasts from both universities thanked the survivors "who are using their voices to change the world and the sport that unites us all for the better." 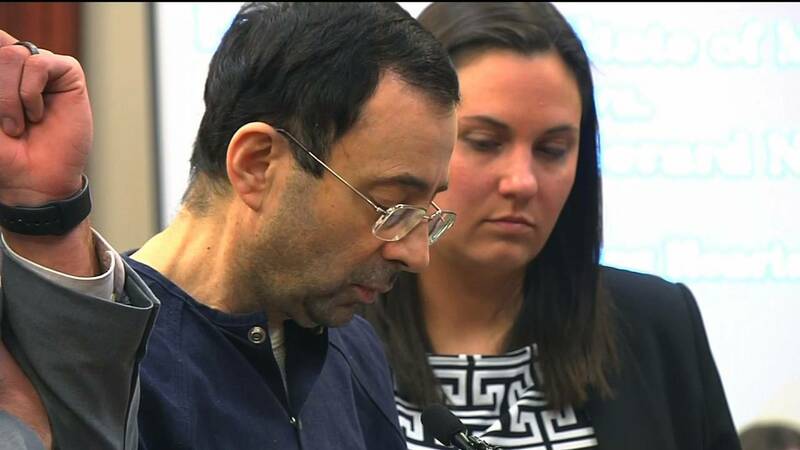 Nassar, a former doctor for USA Gymnastics, will spend the rest of his life in prison after he admitted to using his position as a trusted physician to sexually abuse young girls under the guise of providing medical treatment. Larson was one of many victims who testified at his sentencing.